Thanks to much hard work by the candidates from previous years, and all the folks who came to our forum last month, we have three very inspiring people who are running for school board this year! They are: Sabrina Charles-Pierre, Reverend Jose Cintron and Miriam Moster. 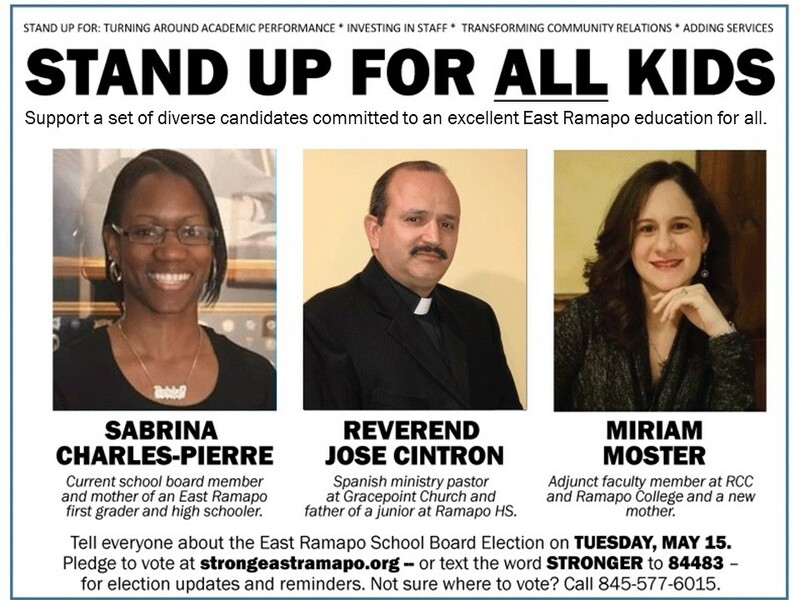 Strong East Ramapo is doing a get out the vote campaign again this year. It starts with you pledging to cast your vote. We want to spend the evening with you! Come for the music of Spyro Gyra’s Jeremy Wall and Motherland Rhythms’ Arthur Lorde, hear from our 2018 candidates, enjoy light refreshments, and help us reach our $5,000 goal for campaign supplies. Details and RSVP HERE, donation info and donate online HERE.